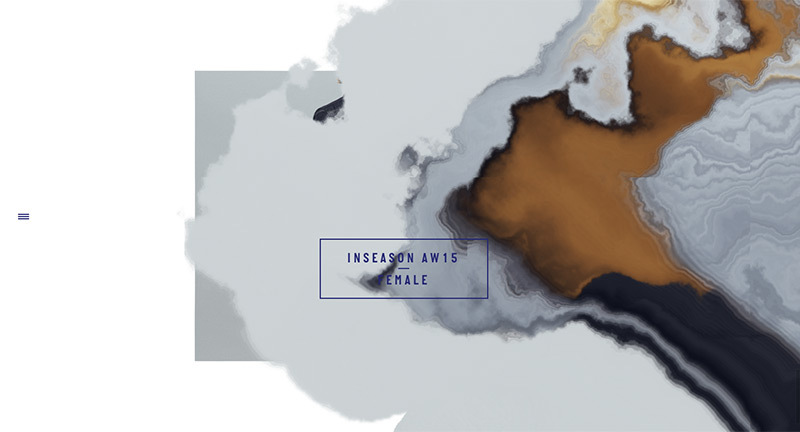 Danish fashion label’s AW 2015 collection. 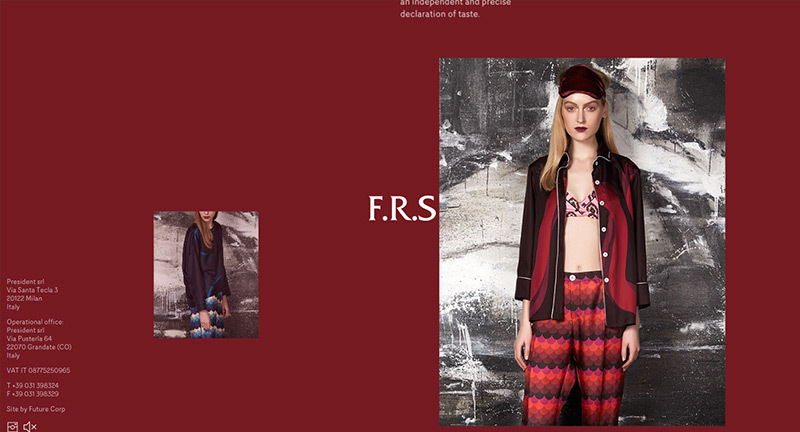 Love the homepage – scroll and the photos become distorted and lead either to the men or women’s collection. 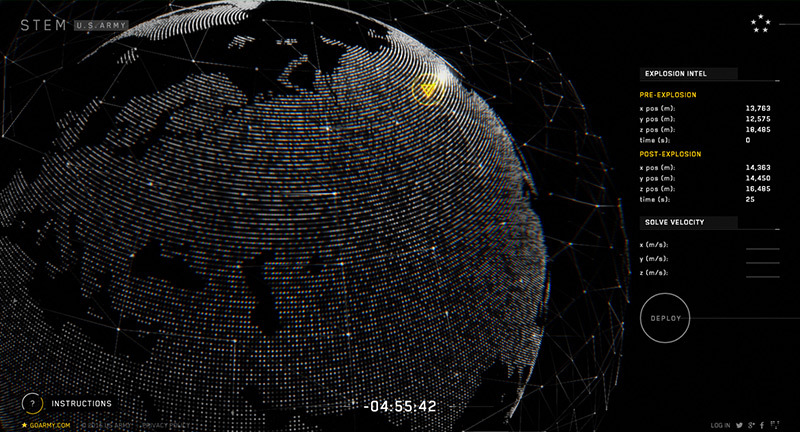 Nice use of 3D and parallax in the deeper view, looks great too. 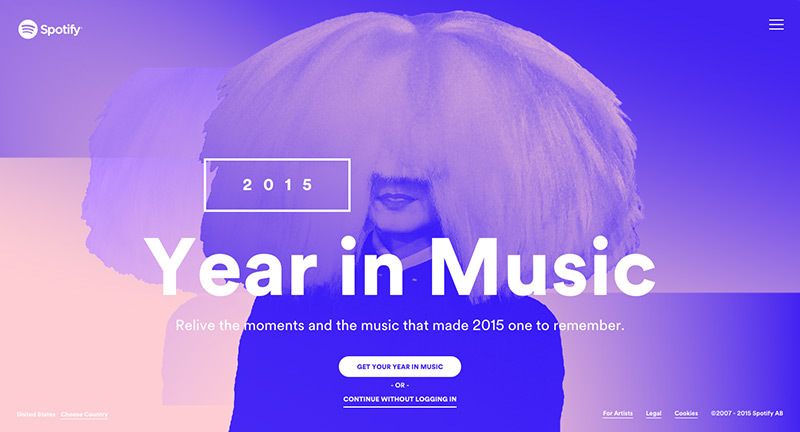 Sweet transitions and subtle use of UI. Site of Mike Bloomberg the founder of Bloomberg and a NY mayor. Lots of nice UI moments, and transitions, that breathes life into some pretty dry content. 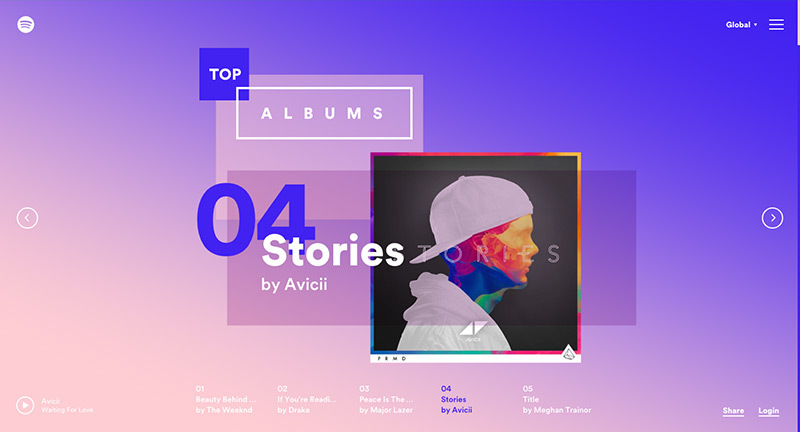 Like the top nav, and the way it evolves depending on context, and the preloader bar with slide in page content. 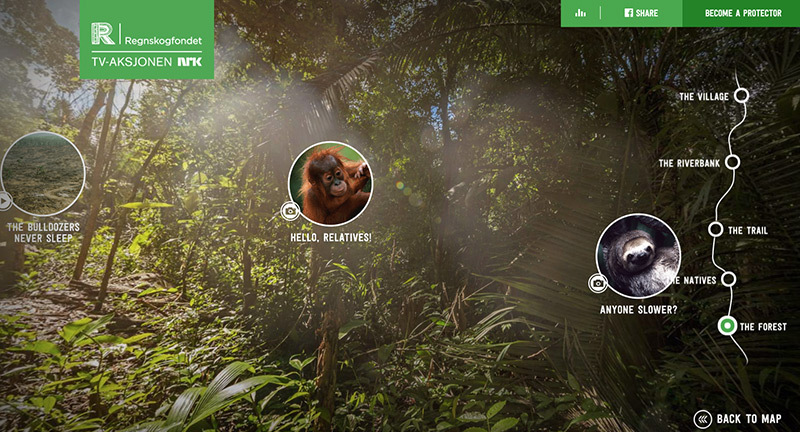 Some nice interactive modules and carousels – all wrapped up in a nice looking layout and design. 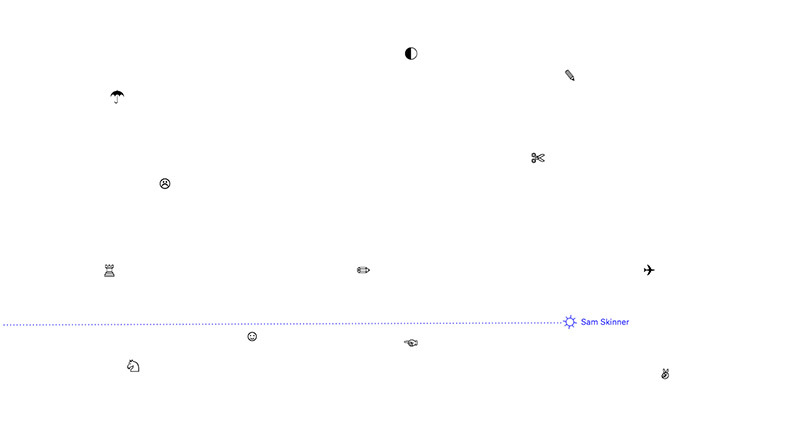 Super cool and minimal portfolio for Sam Skinner an artist and designer based in the UK. 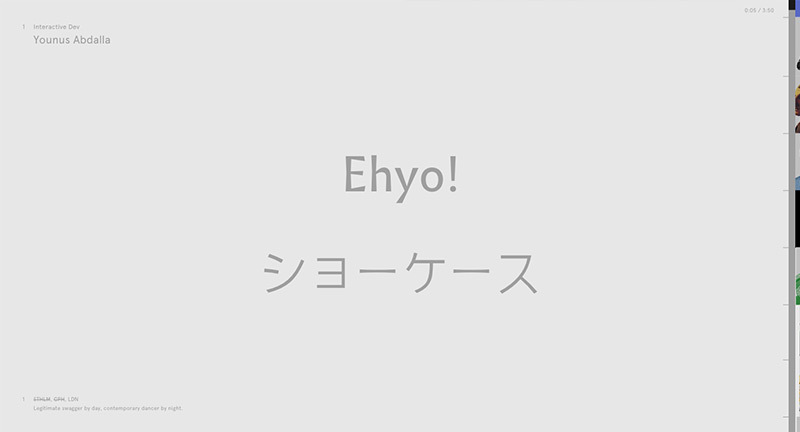 Lovely emoticon based navigation – when you tap into a subject the element stays sticky. 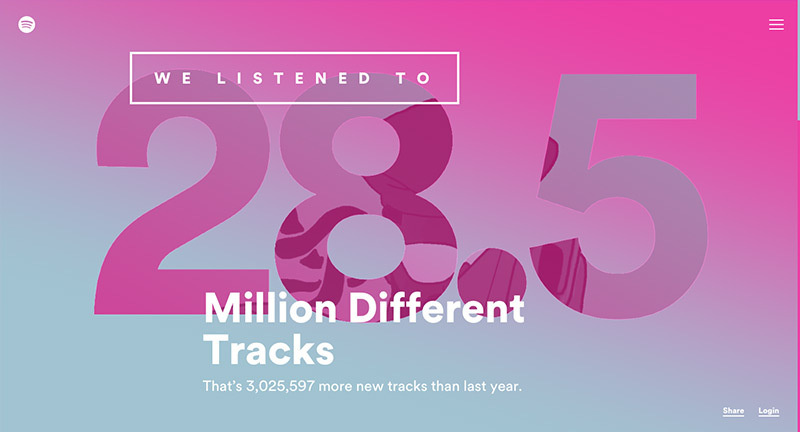 Nice offset grid and super simple interactions – feels very elegant and well thought out. 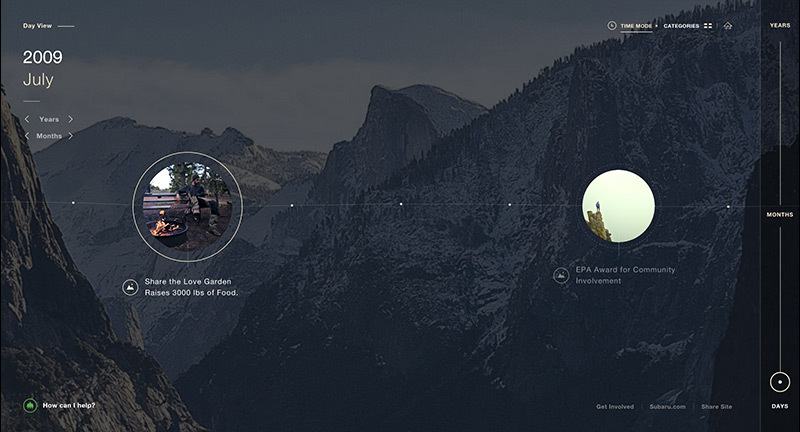 Nice to see people still coming up with refreshing and thoughtful navigation and layout. Created by Jake Dow-Smith (@jakedowsmith). 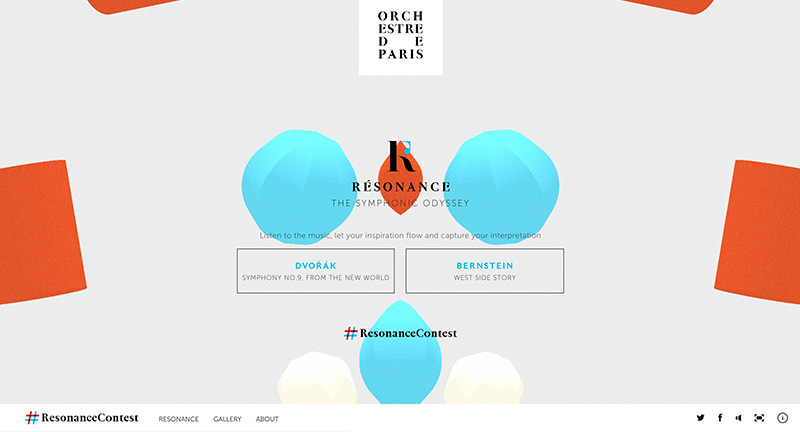 Interactive experience for The Orchestra of Paris. 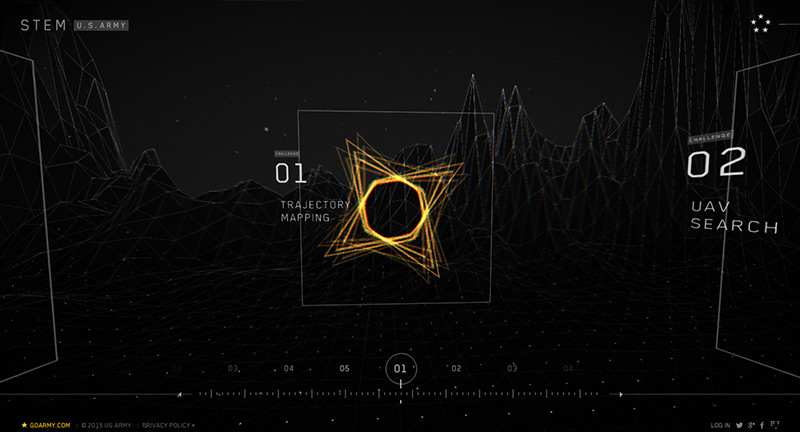 Using pieces of music and setting them to dynamic 3D fly throughs of imaginary landscapes, as you move your cursor a trail appears and shapes move depending on your position. 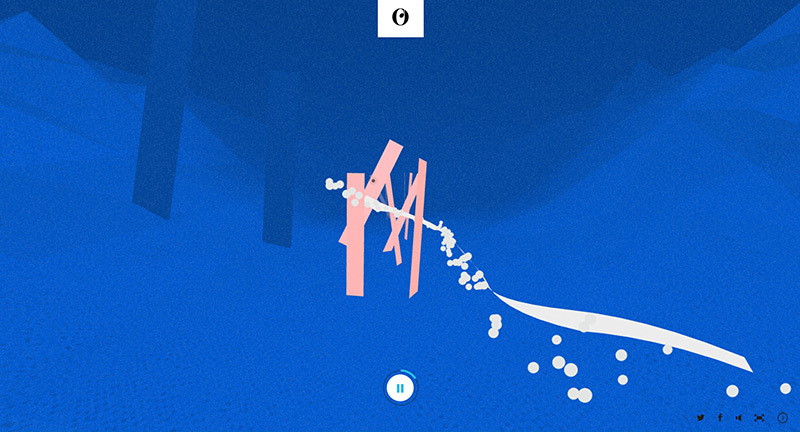 A nice interactive way of engaging with classical music. Love the way the colours change over time and fun to play with. Created by Soleil Noir (@SN_Studio). 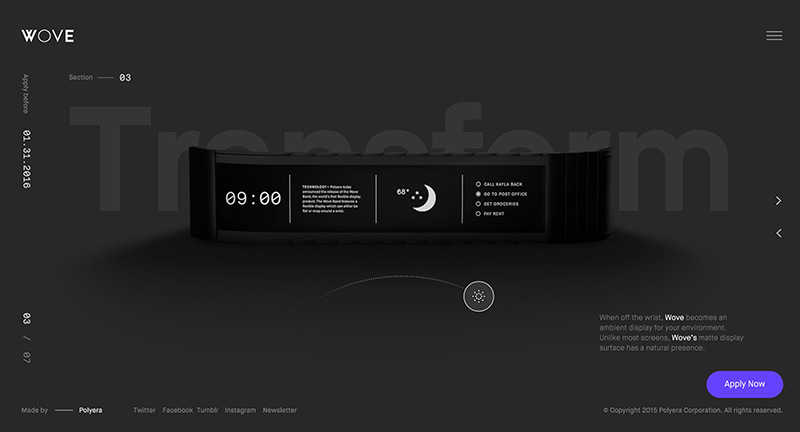 Site for new wearable technology product Wove using a flexible display. 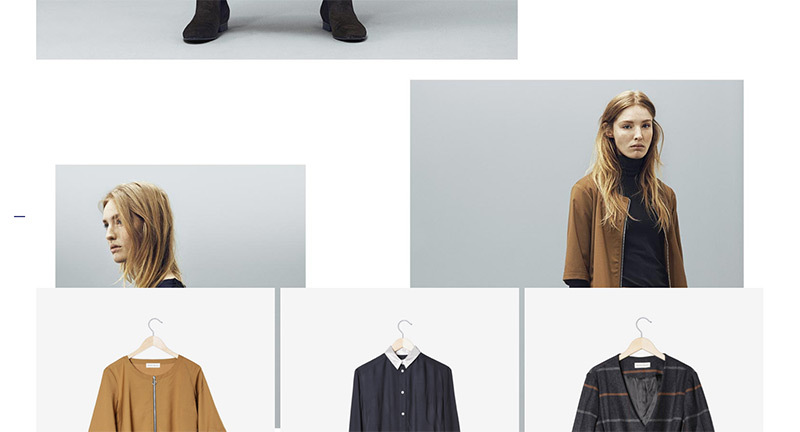 The site focuses on the different benefits and features of Wove, with neat little interactions the animate the Wove to change its display or share and so on. 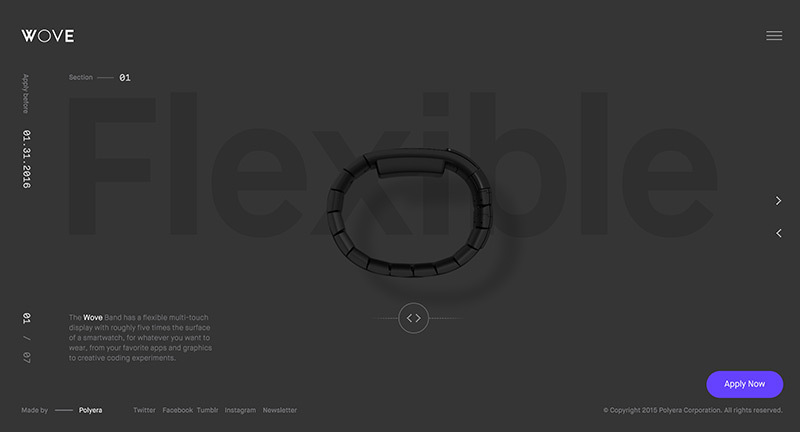 Lots of nice features and minimal layout that encourages you to cycle through the features of the product. 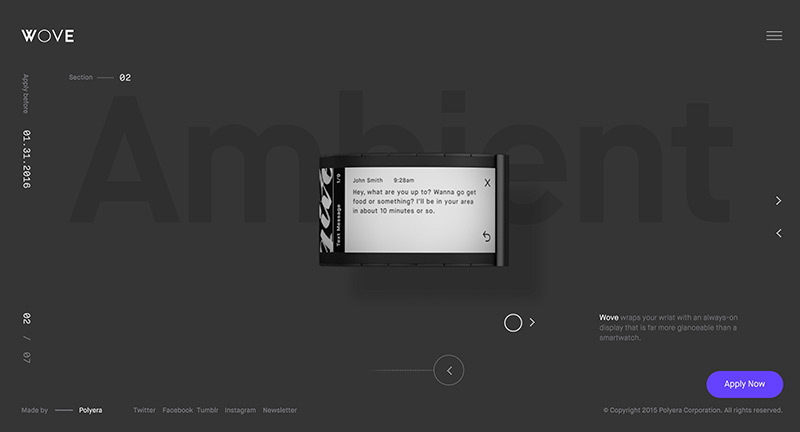 Looks cool , great transitions between sections, and interesting menu execution. 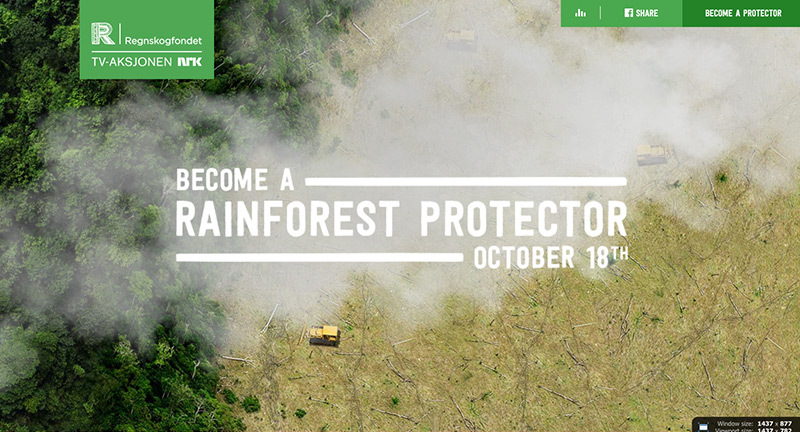 Norwegian Telethon campaign to help save the rainforest and raise money for forests in Peru, Brazil, DR Congo and New Guinea. 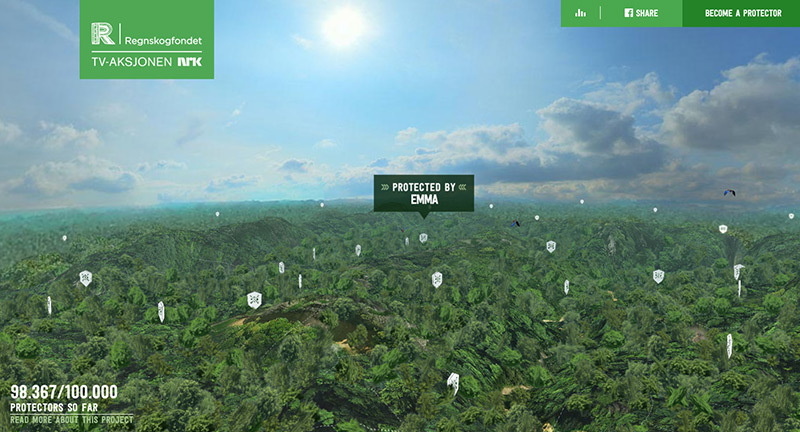 Lovely 3D execution that maps a forest with areas to explore marked with areas sponsored by donors, highlight animals and stories to explore. Love the panoramas of the locations such as riverbanks, villages, trails and so on. Short videos and imagery can be explored from this view – all explaining the balance between natives, nature, and the impact modern life is having. 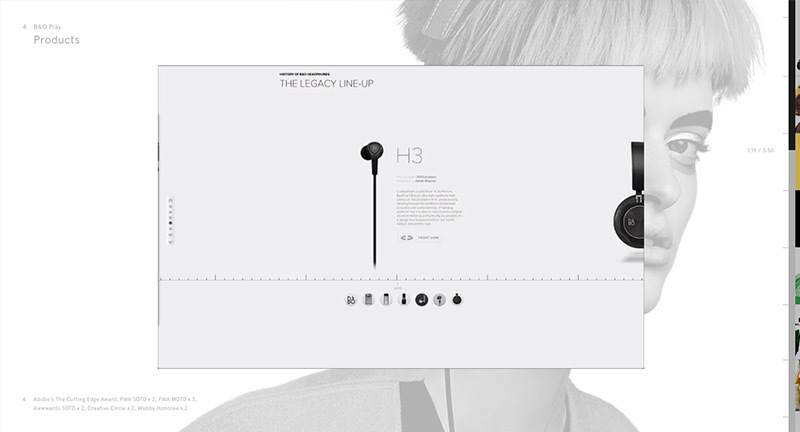 Lots of nice transitions and animations, nicely designed layout and well integrated 3D complete the site. Created by Try/Apt (@TRYReklame) and Pol (@polsiden). 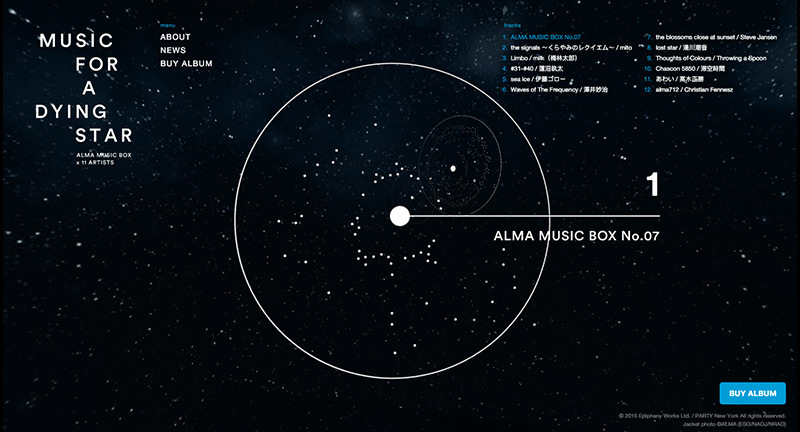 Site promoting new compilation album ‘Alma music box’ – a collaboration with various artists using data from space observatories in Japan. 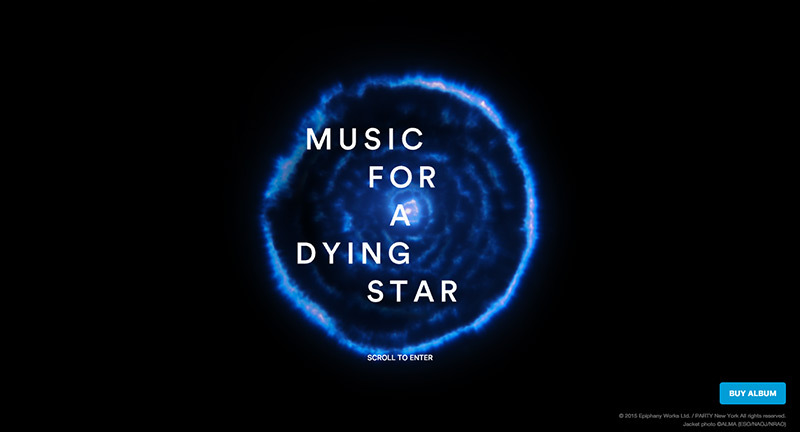 The site shows 3D rotating discs playing snippets from the album, highlighting some of the data used as rhythms – tying back to the idea of star constellations. 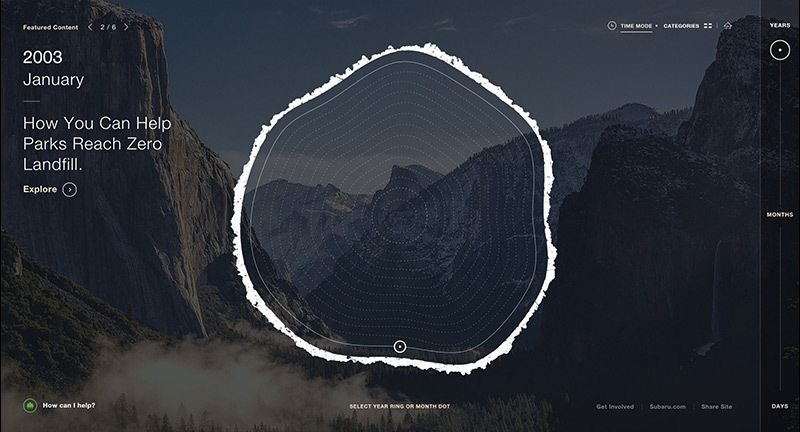 Beautiful execution and interesting way of creating a new album microsite. Created by Epiphany Works (@Epiphanyworks) and Party NY (@prty_ny). 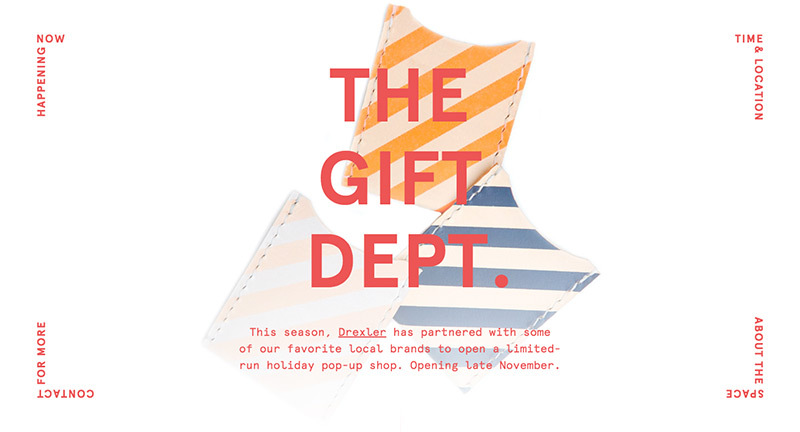 Pop up shop site, promoting the partnership with a creative agency and local designers / shops etc. 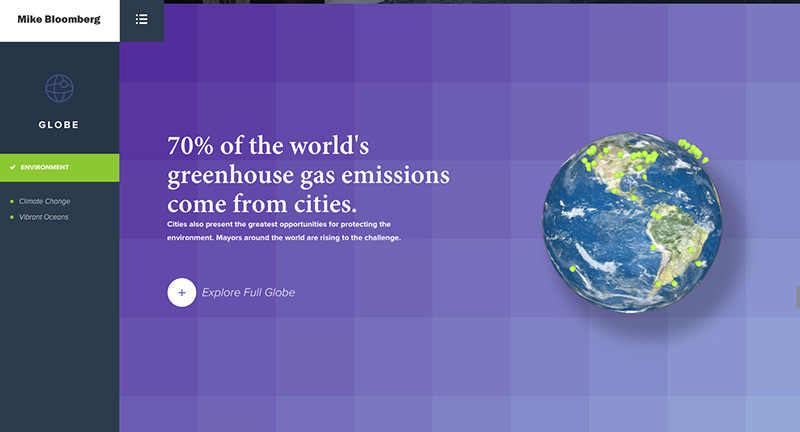 Nice bit of parallax with imagery, nice type, nice small interactions. 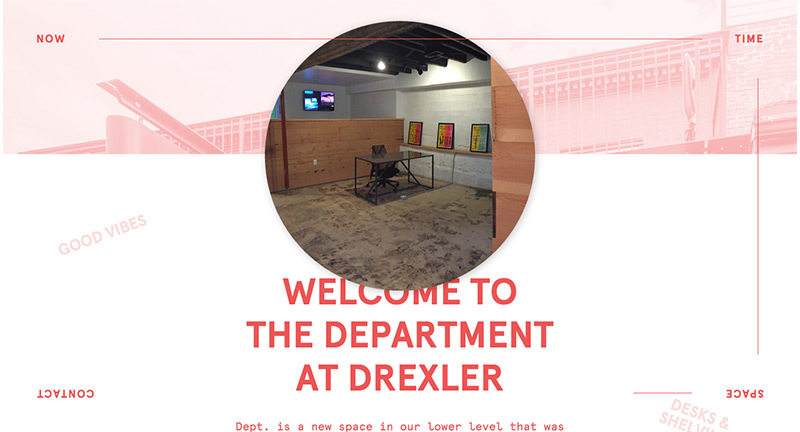 Love the way the layout is broken up with interesting segments, circles, and when you scroll to the bottom you get a nice segway then it places you at the top of the site again. Site promoting the US Army and recruitment for STEM capabilities (science, technology, engineering, math). 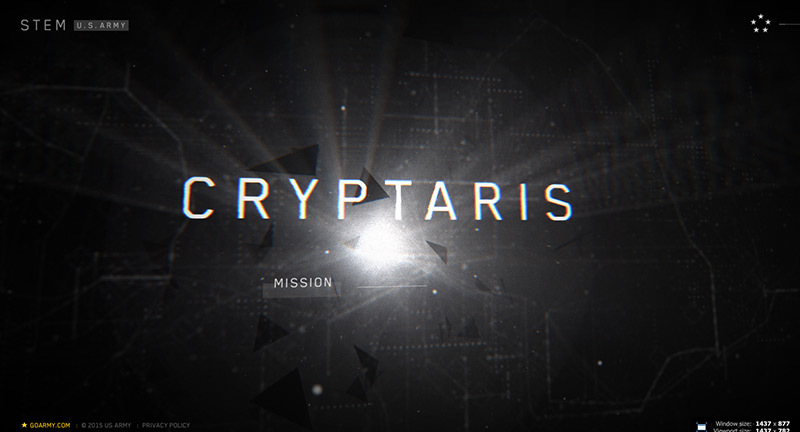 With a futuristic 3D look and feel you can play a series of challenges that map back to STEM such as guiding a drone over a landscape, decrypting codes and so on. Execution is superb, with the whole world rendered in 3D – landscapes, details, and interactions – the ‘path clearing’ is a great example. 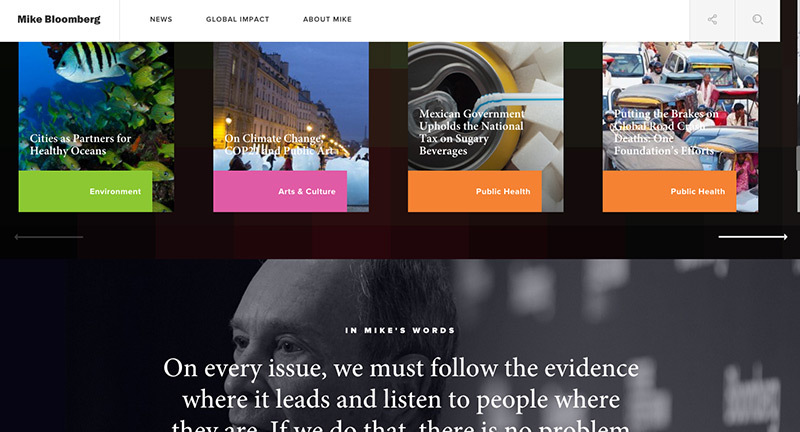 Love the look and feel of the site – very impressive, and it also works nicely on mobile. 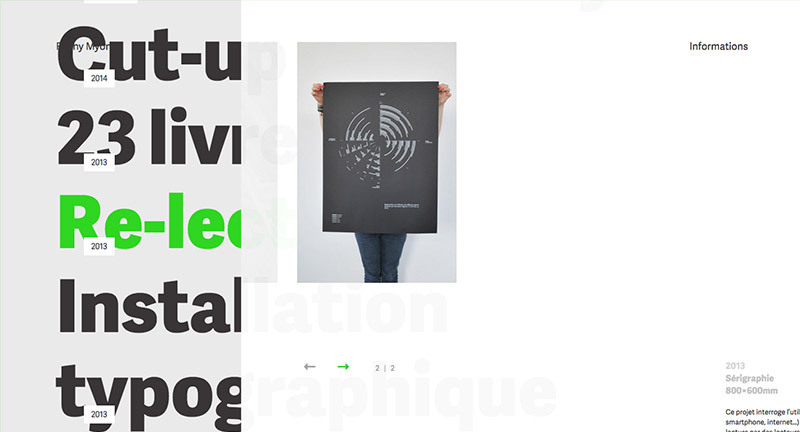 Site of French graphic designer Fanny Myon. 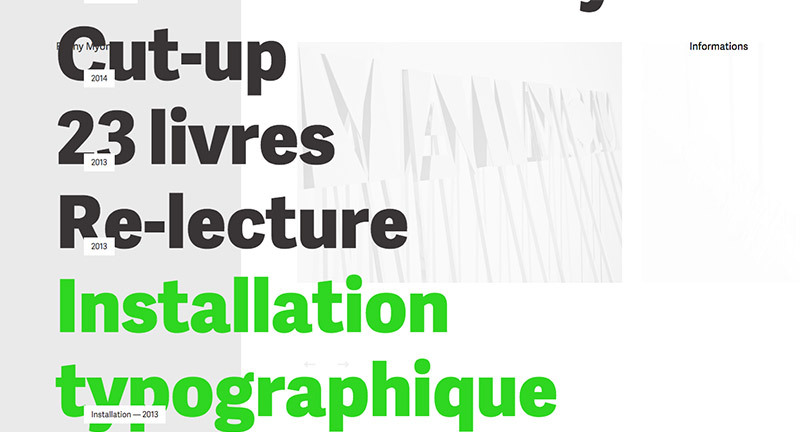 Nice bold typographic layout, with sliding panels revealing the project details – really simple and elegant. 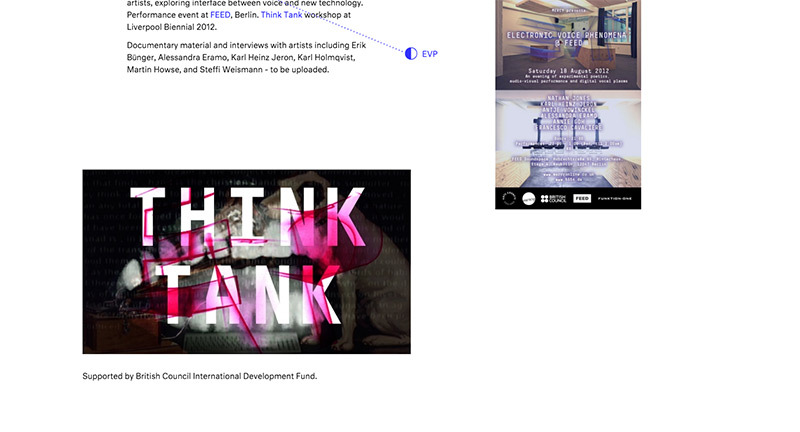 Some nice details with rollovers and so on, and love the way the highlight colour changes when you revisit. Created by Slyvain Jule (@sylvain_jule). Highlighting Subaru’s CSR initiatives and relationship with the environment. 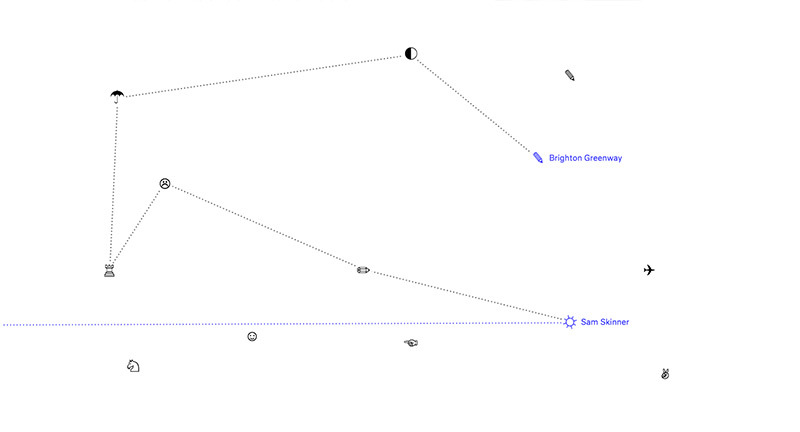 Featuring a dynamic and fluid timeline that is first formed by tree rings – you can zoom in and out and the timeline unravels and populates with events. 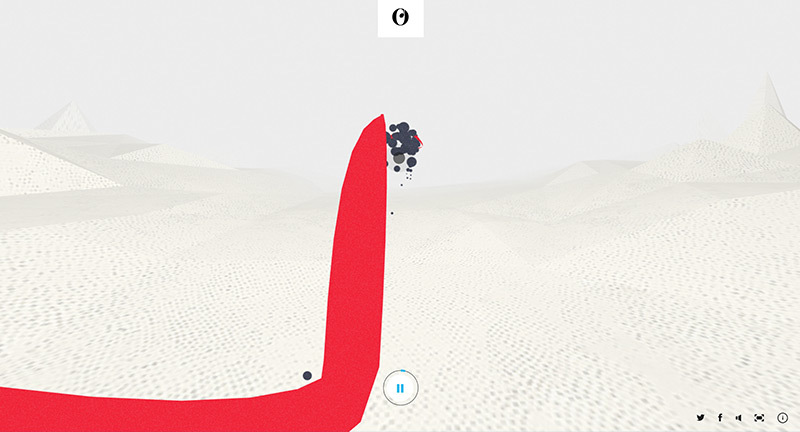 The execution sets this whole experience a level above, from the slick transitions, animations, and interactions. 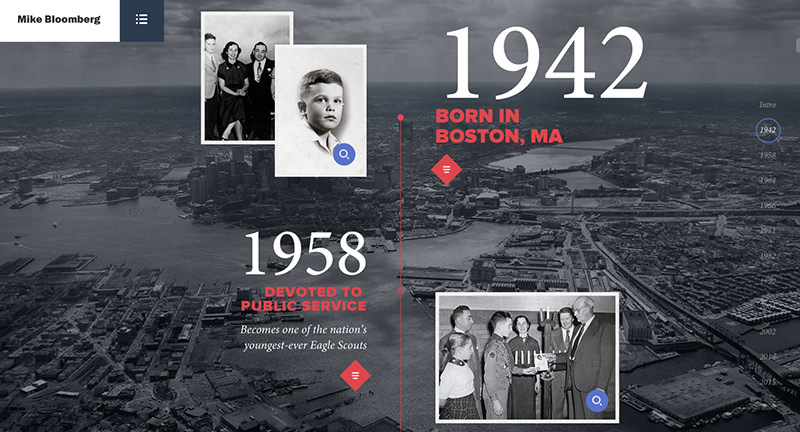 Fantastic attention to detail – great example of a timeline based experience. 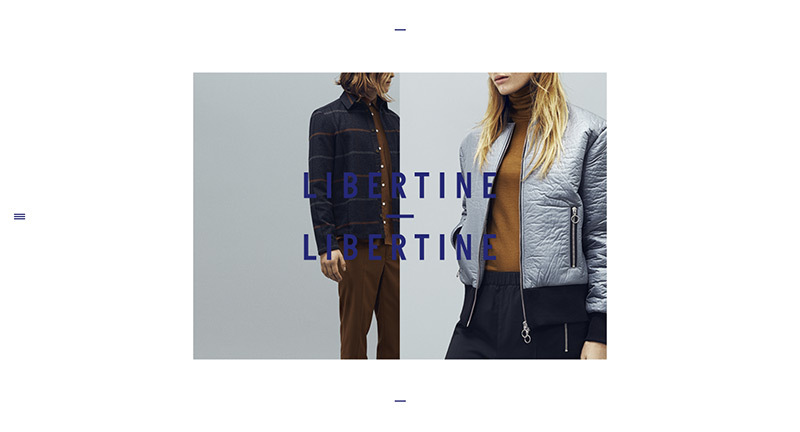 Simple and cool site for fashionable sleep wear. Love the floaty dream like interaction model, elegant and simple, copy and images float around – click on an image and it gets bigger. 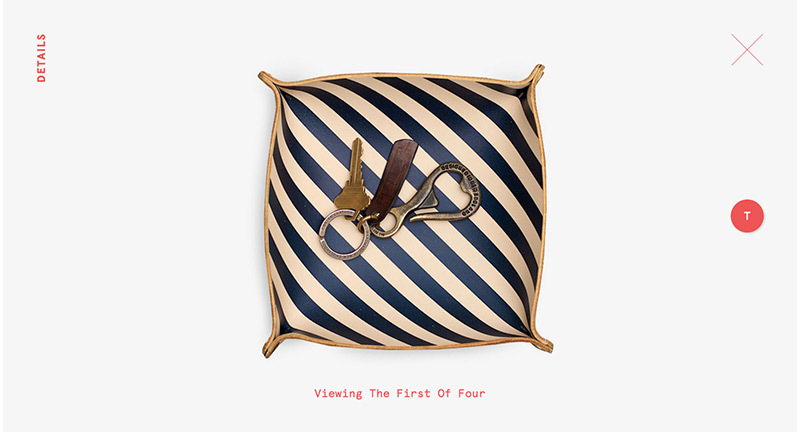 Love the feeling of depth and fluidity – nice. 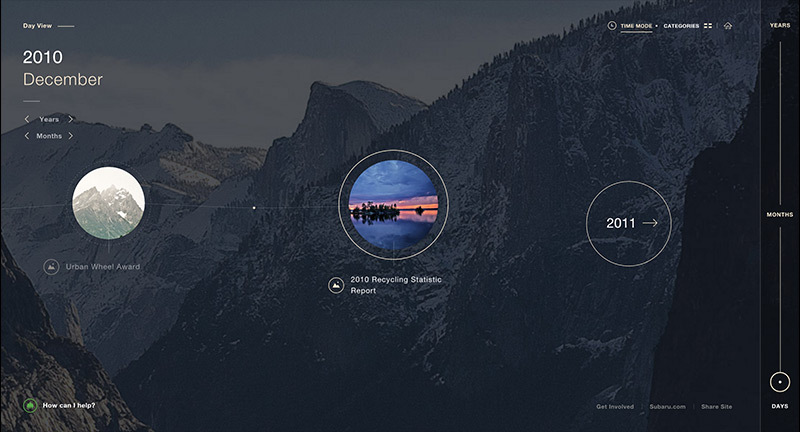 Fantastic portfolio by creative developer Younus Abdalla. 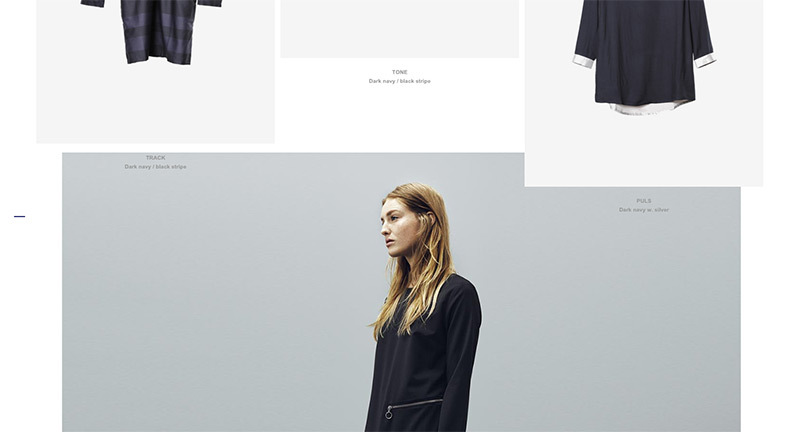 Super simple, featuring screen captures of his work in an elegant minimal interface. 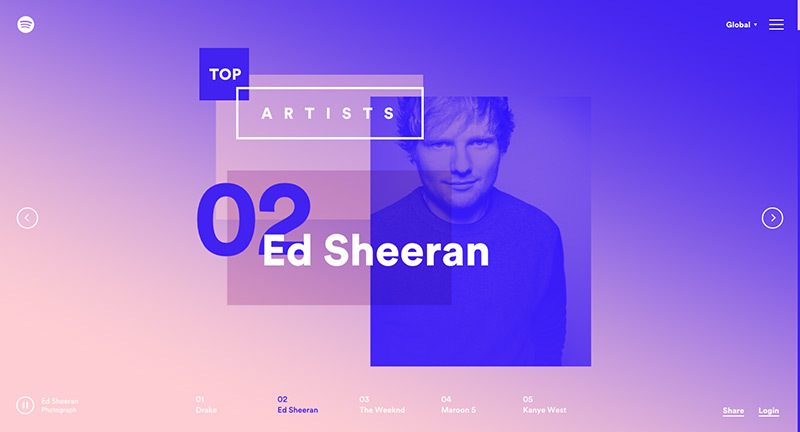 Love the slide out nav and the personality in the animation and interactions. 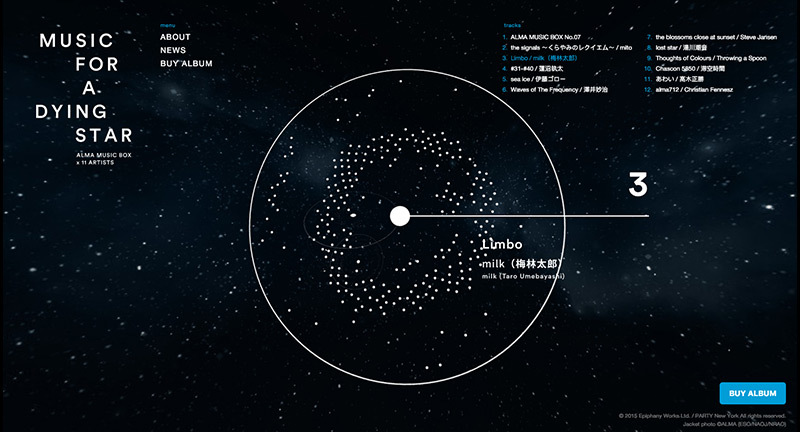 It is also beautifully designed, with nice attention to detail – love the feeling of energy and movement in the layout. Great example of a modern portfolio. Created by Younus Abdalla (@younusabdalla).